The buttery soft sugar cookie, sprinkled with powdered sugar, filled with sweet raspberry jam. They are every bit as tasty as they are adorable. Perfect for a gift for a loved one on Valentine's day or other special occasions. In a small bowl, mix together the flax or chia with the water and set aside to thicken. In a third bowl beat the vegan butter and sugar together until creamy, about 3 minutes. Add the remaining wet ingredients including the flax or chia mixture, and mix well. Add the wet mixture into dry and combine until a dough is formed. I have found that sometimes the moisture levels in vegan butters are different, so if your dough does not come together, add up to 1 tablespoon of water until the dough just comes together. Put the dough between two sheets of parchment paper and roll it out to about 1/4 inch thick. Now pop it onto a baking tray and chill the rolled dough in the freezer for 15 minutes or in the fridge for 30 minutes. Once chilled, use a heart cookie cutter (or another shape) to make as many heart cookies as possible. Leave half of the heart cookies whole, and use a tiny heart cookie cutter (or another shape) to cut out the center of the remaining half. Lay them on the parchment lined cookie sheet. Re-roll remaining dough until it’s all used up, chilling in between if needed. Bake 7 - 11 minutes. until they are just a little bit golden on the bottom. Let the cookies cool completely before assembling. 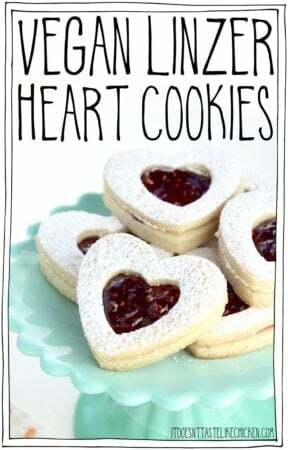 Place all of the cut-out heart cookies on a piece of parchment paper. Use a fine mesh strainer of a sifter to sprinkle the powdered sugar over top. For the bottom layer of the cookie, take a whole cookie and spread about 1 teaspoon of the jam on the cookie keeping most of the jam in the center. Top with a powdered sugar coated cut-out cookie. Repeat with all the remaining cookies. The cookies will keep for about a week when stored at room temperature in an air tight container.